Barby Trendy Bag is a bundle of joy specially made for children! This bag carries a deodorant spray, a moisturiser and a shampoo. Barbie Deodorant is a sweet, fruity fragrance. Gives a pleasant scent which lingers around for hours. Safe for kids, because it is alcohol free. A 100 ml bottle of beautiful scent lasts for days. Barbie Moisturiser is formulated with natural, skin friendly extracts. Specially developed for kids tender skin, it has buttery smooth texture. Glides over skin effortlessly and get absorbed in no time. Provides moisture and make skin soft, smooth and supple. Pamper your kidA s delicate skin with this beautiful 100ml tube of moisturiser. Barbie Shampoo is the right choice for your kidA s hair woes. Formulated specially for kids it delicately clean hair. Removes dirt, oil and leaves hair, scalp refreshed. Lends pleasant fragrance to hairs. Additional Information:The very first Barbie doll was introduced in 1959 in the USA, by Ruth Handler under Mattel Inc. Till date they continue to grow with their Barbie range of products made for children. 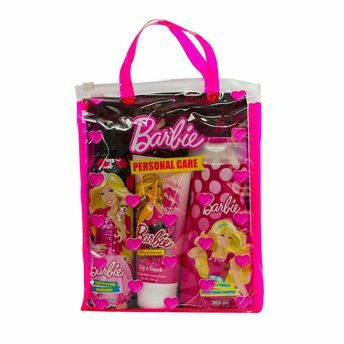 Barbie Trendy Bag is a thoughtfully designed kit for age above 3 years.